Egypt has captured the attention of the world. 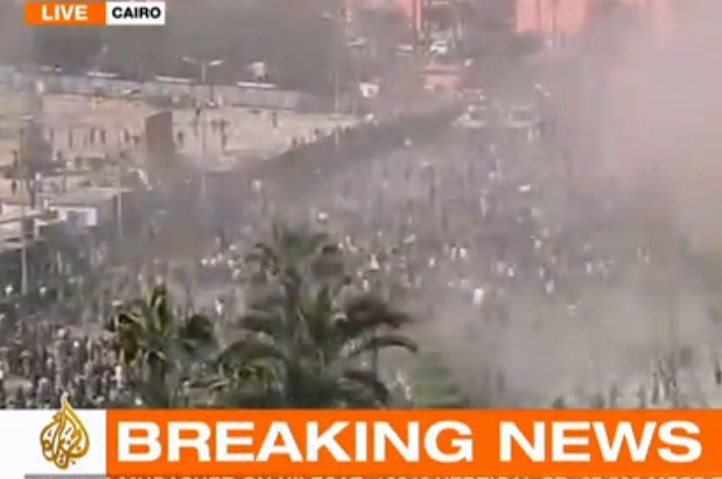 For more than a week protests to oust President Mubarak have dominated headlines. Reporters from many organizations are on the ground in Egypt but none with such force as Al Jazeera. The Qatar based news organization’s coverage is providing the world with a front-row seat to the uprisings and re-sparking decade old debates about Al Jazeera’s place in American media. Will Al Jazeera English break into the American mainstream? I hope so, but if Afghanistan is any indication the chances are slim. Over 10 years ago the Taliban leadership of Afghanistan extended an offer to three international news organizations to set up news bureaus in the country. Al Jazeera was the only one that accepted. The risk, which western media deemed too high, netted Al Jazeera exclusive on the ground coverage of America’s 9/11 revenge tour. Fittingly, Al Jazeera found itself on an island, with no other journalists in sight. Without Al Jazeera American media was stuck talking to experts and peering into the scene with long-distance night-vision shots. Western media outlets paid tens of thousands of dollars for isolated footage and some, like CNN, paid for access to Al Jazeera’s news feed. The organization’s footage even found its way to Fox News. Despite extended use of its products Al Jazeera was rarely mentioned or credited when its images were brought to the American audience. Instead AJ was denounced as a terrorist organization by the Bush administration. Al Jazeera’s motto, “The opinion and the other opinion,” didn’t win it a lot of American support when the other opinion was a Taliban leader or Osama bin Laden. Al Jazeera did get a veiled warning to leave its news bureau before American troops arrived. The warning arrived only briefly before a U.S. missile. When it comes to war by America, especially after 9/11, there was only one opinion—ours. Al Jazeera’s unrivaled coverage of the opening stages of the war in Afghanistan didn’t win the organization any foothold in the US. Less than 5 percent of American cable companies offer Al Jazeera English. Even in light of Al Jazeera’s Egyptian coverage this seems unlikely to change. Businesses face a vocal opposition at the grass roots level and on Capitol Hill. Any company that wants to bring Al Jazeera to a US market will have to face this opposition in favor of a small number of potential viewers. Financially such a decision might not make sense, but it is exactly what our country needs. In a time when America it trying to make sense of popular uprisings, terrorism, two wars, Islam, and the price of gas a few more facts would be helpful. After all we send more money (for aid and oil), troops, and blind animosity to the middle-east than anywhere else in the world. Al Jazeera can do as much to help a western audience understand these issues as anyone. For them the middle-east is local. As for their training, Al Jazeera was built from the ashes of a project between the BBC, and Saudi Arabia (the region’s media powerhouse). All core Al Jazeera reporters were trained by the BBC. It’s time for America to heed its belief in free speech and free press and bring Al Jazeera into our national conversation. There is an old Arabic saying which translates to, “business is cowardly.” For our sake, I hope that isn’t true.